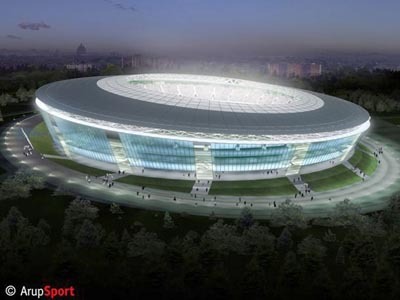 Stadium in Donieck will be the first arena of Euro 2012 which will come into use. Its opening is expected to be in July next year- announced the representative of city council Aleksander Gromakow during the conference of Polish-Ukrainian Self-Government Forum Euro 2012. ‘It will be the biggest and the most modern object in the eastern part of Europe. A roof made of glass will be its main feature. Apart from the stunning visual effect it is also a practical solution because it has a good effect on the grass preservation’- said Gromakow. Stadium is patterned on the modernized Benfica’s object in Lisbon. It will hold 55 thousand spectators and its building cost is estimated on 250 million dollars. ‘There will be cafes, restaurants, fast foods and places where one could relax on the area around the stadium. This area will be available for everyone and everyday. So if a family comes to watch a match but a wife doesn’t want to watch it she can spend time visiting one of the facilities around the stadium’- added Gromakow. So in the next year a new stadium in Dnipropietrovsk is expected to come into use. ‘Conversion of stadium in Charkov is finished in 90 percent. UEFA can add this city to the group of organizers’- said Andrij Mikitiw expert for stadiums in the Ukrainian Football Federation. Over 60 people, representatives of cities-hosts Euro 2012, the Ukrainian police, Polish embassy in Kiev and the staff of football federation from both countries took part in the conference of Self-Government Forum which lasted a few days in Dnipropietrovsk and Donieck and finished on Saturday. My comment Is Europe will be amazed about the stadiums and the Polish ,Ukraine Culture. 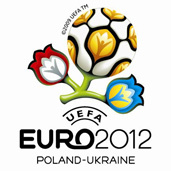 Its our turn to bring EURO 2012 .